“Exploring Oregon Ecosystems: From Oak Savanna to Riparian Woodland” is an environmental education program with outdoor experiences for both teachers and 3rd-grade students. 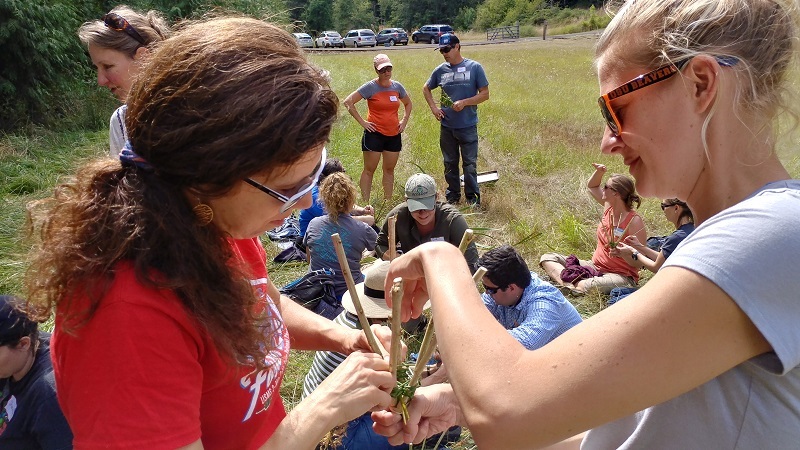 By developing a deeper understanding of oak and riparian ecosystems and familiarity with field techniques through the teacher workshop, this project will provide a pathway to engage students in an inquiry-based field and classroom program. The project is being led by Greenbelt Land Trust, the Institute for Applied Ecology, and Marys River Watershed Council with generous support from the Gray Family Foundation, Willamette Habitat Restoration, and others. The project is based at the Bald Hill Farm Conservation Area. The following story is from a recent teacher seminar. Teachers gather at Bald Hill Farm and gain field skills to bring back to their grade-school students. Jessie Brothers (Institute for Applied Ecology) unspooled a length of river-colored, blue-green yarn. Holding one end of the yarn, she expertly threw the ball to Anicia Criscione, a grade-school teacher, who caught it like a star Little League player. 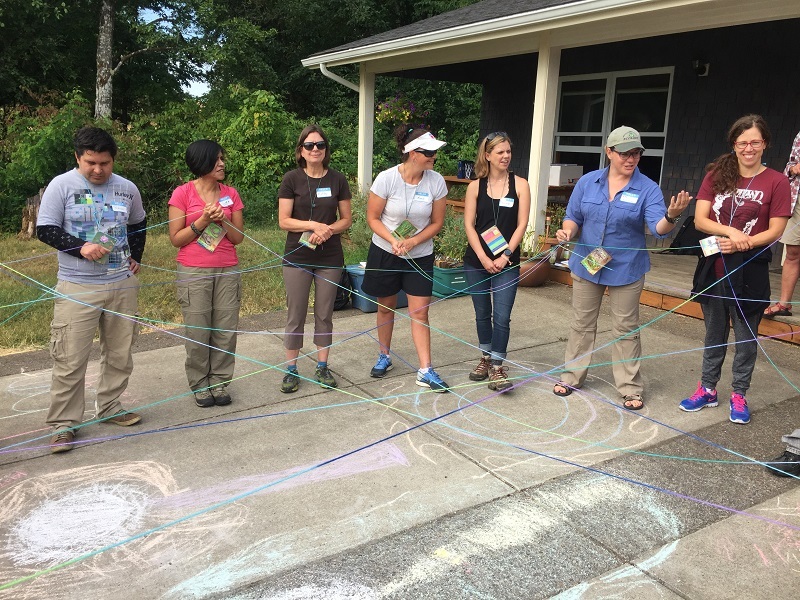 A group of 18 teachers, guided by Jessie and her environmental education colleagues, were playing a food web game destined for the teacher’s 3rd, 4th, and 5th-graders. As the ball of blue-green yarn crisscrossed the circle, everyone could see how each plant or animal had multiple connections. A beautiful spider web formed in between the teachers, reminiscent of a giant cat’s cradle game. Teachers learn about food webs through a hands-on activity that is all about fun and games! Are there seemingly simple childhood moments that you remember vividly, like when you first learned to tie your shoes— a challenge but also a game of mastery that would become ingrained in your muscle memory? I could see teachers receiving this lesson in a similar way as the yarn of the food web wove back and forth across the circle. This school year, some 8-year-olds would repeat the same pattern, affirming the connections of the birds, insects, fish, plants, and wildlife with whom we share the Willamette Valley. There was not a human represented among the creatures in the food web game, but one teacher jokingly pretended to be one. I can imagine the child who would choose the human card if it was included in the game. He might be a bit of a smart alec, always interrupting. He might charge the web with a pair of scissors, snipping the connections or tangling them as he ran through. But the human card in the deck could show a very different role in the food web than just being a snipper of threads. 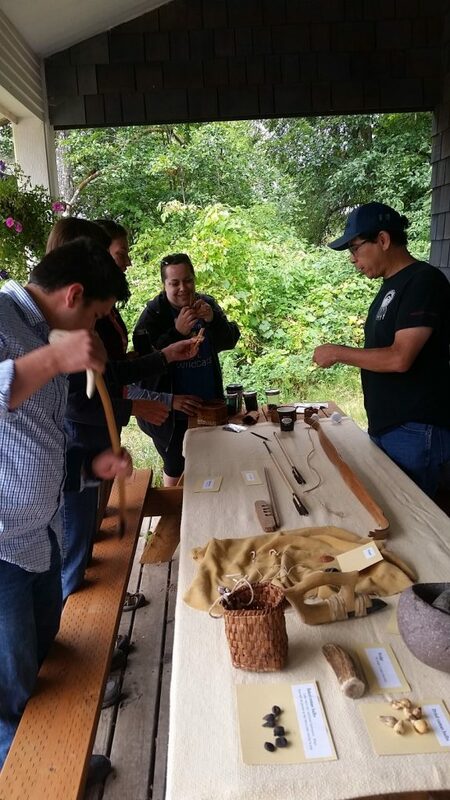 Greg Archuleta, a cultural resources educator with Confederated Tribes of the Grand Ronde, offered the cohort of teachers a look at how humans have been connected with the local ecosystem for thousands of years, traditions that Greg and others foster today. Walking through a restored oak savannah at Greenbelt Land Trust’s Bald Hill Farm Conservation Area, teachers learned how people managed oak habitats with controlled burns, preventing big fires, increasing growth of acorns, a staple food of local indigenous families, and enhancing habitat for wildlife (and also food for people). Teachers handled facsimiles of tools, medicines, clothes, and foods that came directly from the landscape, shared by Greg Archuleta and by Judy Rycraft Juntunen at the Benton County Historical Society and Museum. Greg Archuleta shows teachers indigenous tools, foods, and clothing derived from the land. With instruction from Stacy Moore at Institute for Applied Ecology, teachers made their own baskets from cottonwood, cattail, rushes, and sedges. Paul Bradley and Tom Day made basket weaving into a team effort. One held the “ribs” of cottonwood while the other wove rushes, sedges, and cattails in and out between them, making a mini facsimile of a basket that someone might have used to gather acorns in the mid-1800s. Students who experience these lessons can make their own connections about how food webs and baskets are woven together— and the choices we all face to decide whether we are weaving or unraveling. Learning traditional weaving techniques, teachers work together to make baskets used to collect nature’s edible goodies, like acorns. Greenbelt Land Trust would like to thank the following funders for making this teacher workshop possible: Gray Family Foundation; Willamette Habitat Foundation; Haswell Foundation; Oregon Sea Grant StreamWebs Program; Corvallis School District; OSU Thrift Store Foundation; Corvallis Evening Garden Club. 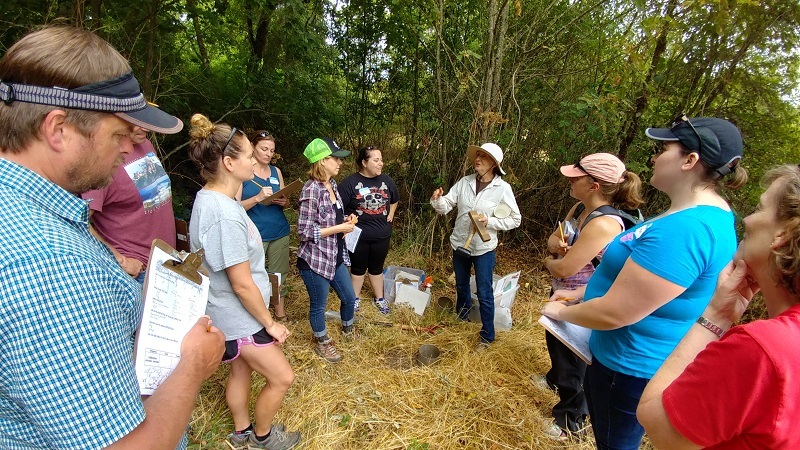 The primary partners for this program are the Institute for Applied Ecology, Marys River Watershed Council, Greenbelt Land Trust, and the Corvallis School District. Additional partners include: Cascadia Expeditions, Oregon Sea Grant StreamWebs, Benton Soil & Water Conservation District, Steve Clarke, Jeff Mitchell, Benton County Historical Museum, Confederated Tribes of the Grande Ronde.